Surf movies projected onto the cliff face in Brighton! 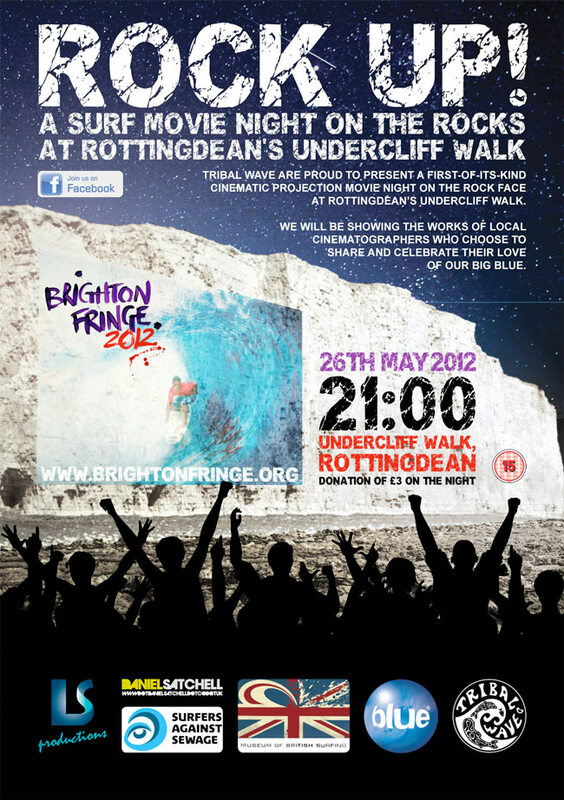 Tribal Wave invite you to be part of a unique showcasing of local surf cinematography projected up on the rock face at Rottingdeans Undercliff walk. This event is part of The Brighton Fringe Festival visual arts and we look forward to sharing some fabulous local talent who are all celebrating their personal love of the big blue. We have a 5 minute short from the legendary Surf Champion and Big Wave Rider Gabe Davies - "Fathoms left to Fall" a Northcore production. We are sorry that The Endless Winter will not be finished in time but if the evening is a success then we hope to screen it on the rock face around September time. Due to the nature of the event being outside it is obviously going to be weather dependent, so we can only pray for a starry night and hope to see you all there. It is not a particularly well lit spot on the way down so we recommend a torch and if you feel the cold easily please bring a blanket. I will update further with regard to food and drink availability as that is still to be confirmed. Finally before I sign off, we have stated it is £3.00 donation on the night as we still like to give a percentage to help and support our charities, SAS, The Museum of British Surfing & The Blue Climate Project, Jock will speak more on the night as to where this goes and what it helps with. Look forward to seeing you all.